This is one of, if not my very favorite, paintings. In the most simple, concise terms- it’s pretty. Degas’ lyrically painted ballerinas and his elegant use of warm colors is unmatched by any other impressionistic painters. Touching on Degas’ smaller details, there is also elegance in the fragmented light coming in through the windows, the use of a muted but somehow still striking color palette and the simple and yet expressionistic faces of the figures which all contribute to me starring at the piece as if I’m being hypnotized. It’s Degas talent to make an image that initially seems as if it is being seen through a foggy lens still seem so alive that is truly remarkable. 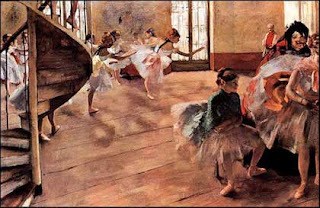 Degas was known for his collection of beautiful work of ballet dancers. He was also known for his use of unique perspectives and angles in them. The Rehearsal is an example of this, allowing the audience to feel as if they are getting a secret glance at the practice. The forefront in the painting carries the largest and boldest variety of colors in the color palette with the deeps green shawl, dark black hair, crimson robe and a rich peach tutu. This contrasts with the more subdued background. The only bold colors are in the small ties around the dancers’ necks and the crimson robe of the small man in the right corner. At first sight, it’s the appeal of the dancers that draws the viewer in. Yet, it’s the tiny and endless details and impressionistic style that keeps the viewer entranced by the image. Hence, making this my favorite piece.